Classes shall be abstract from the particular layer they are running - see Multi-tier architecture. To take an example from real coding, imagine you define a communication component. You want to communicate, say, with a bar-code scanner peripheral. You may define a single class, e.g. TBarcodeScanner, supporting such device connected over a serial port. Later on, the manufacturer deprecates the serial port support, since no computer still have it, and offer only USB models in its catalog. You may inherit from TBarcodeScanner, and add USB support. But in practice, this new TUsbBarCodeScanner class is difficult to maintain, since it will inherit from serial-related communication. Then, TSerialBarCodeScanner and TUsbBarCodeScanner classes would override those classes, according to the final implementation. In fact, this approach is cleaner. But it is not perfect either, since it may be hard to maintain and extend. Imagine the manufacturer is using a standard protocol for communication, whatever USB or Serial connection is used. You would put this communication protocol (e.g. its state machine, its stream computation, its delaying settings) in the TAbstractBarcodeScanner class. But perhaps they would be diverse flavors, in TSerialBarCodeScanner or TUsbBarCodeScanner, or even due to diverse models and features (e.g. if it supports 2D or 3D bar-codes). It appears that putting everything in a single class is not a good idea. Splitting protocol and communication appears to be preferred. Each "axis of change" - i.e. every aspect which may need modifications - requires its own class. Then the T*BarcodeScanner classes would compose protocols and communication classes within a single component. Here, we inject the connection instance to the protocol, since the later may need to read or write some bytes on the wire, when needed. Another practical "Single Responsibility Principle" smell may appear in your uses clause. It would induce a dependency about the Windows Operating System, whereas your data would certainly benefit from being OS-agnostic. Our todays compiler (Delphi or FPC) targets several OS, so coupling our data to the actual Windows unit does show a bad design. Similarly, you may add a dependency to the VCL, via a reference to the Forms unit. If your data-only or peripheral-only unit starts like the following, beware! If you later want to use FMX, or LCL (from Lazarus) in your application, or want to use your MyDataModel unit on a pure server application without any GUI, you are stuck. The upcoming Windows Nano Server architecture, which targets the cloud and won't offer any GUI to the server applications, would even be very sensitive to the dependency chain of the executable. Note that if you are used to developed in RAD mode, the units generated by the IDE wizards come with some default references in the uses clause of the generated .pas file. So take care of not introducing any coupling to your own business code! As a general rule, our ORM/SOA framework source code tries to avoid such dependencies. All OS-specificities are centralized in our SynCommons.pas unit, and there is no dependency to the VCL when it is not mandatory, e.g. in mORMot.pas. Following the RAD approach, you may start from your UI, i.e. defining the needed classes in the unit where you visual form (may be VCL or FMX) is defined. Don't follow this tempting, but dangerous path! In your actual project units, when you define an ORM or SOA class, never include GUI methods within. In fact, the fact that our TSQLRecord class definitions are common to both Client and Server sides makes this principle mandatory. You should not have any GUI related method on the Server side, and the Client side could use the objects instances with several GUI implementations (Delphi Client, AJAX Client...). Therefore, if you want to change the GUI, you won't have to recompile the TSQLRecord class and the associated database model. If you want to deploy your server on a Linux box (using e.g. CrossKylix or FPC as compiler), you could reuse you very same code, since you do not have reference to the VCL in your business code. This Single responsibility principle may sound simple and easy to follow (even obvious), but in fact, it is one of the hardest principles to get right. Naturally, we tend to join responsibilities in our class definitions. Our framework architecture will enforce you, by its Client-Server nature and all its high-level methods involving interface, to follow this principle, but it is always up to the end coder to design properly his/her types. It means that you may be able to extend your existing code, without breaking its initial behavior. Some other guidelines may be added, but you got the main idea. When designing our ORM/SOA set of units, we tried to follow this principle. In fact, you should not have to modify its implementation. You should define your own units and classes, without the need to hack the framework source code. As a beneficial side effect, this principle will ensure that your code would be ready to follow the framework updates (which are quite regular). When a new version of mORMot is available, you should be able to retrieve it for free from our web site, replace your files locally, then build a new enhanced version of your application, with the benefit of all included fixes and optimizations. Even the source code repository is available - at http://synopse.info/fossil or from https://github.com/synopse/mORMot - and allows you to follow the current step of evolvment of the framework. In short, abstraction is the key to peace of mind. 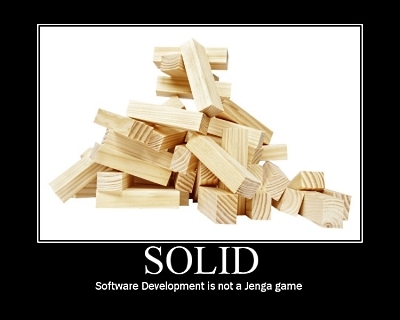 All your code shall not depend on a particular implementation. In this code, the actual variables are stored as protected fields, with only getters (i.e. read) in the public section. There is no setter (i.e. write) attribute, which may allow to change the fProtocol/fConnection instances in user code. You can still access those fields (it is mandatory in your inherited constructors), but user code should not use it. As stated above, for our bar-code reader design, having dedicated classes for defining protocol and connection will also help implementing the open/close principle. You would be able to define a new class, combining its own protocol and connection class instances, so it will be Open for extension. But you would not change the behavior of a class, by inheriting it: since protocol and connection are uncoupled, and used via composition in a dedicated class, it will be Closed for modification. Using the newest sealed directive for a class may ensure that your class definition would follow this principle. If the class method or property is sealed, you would not be able to change its behavior in its inherited types, even if you are tempted to. About the singleton pattern, you should better always avoid it in your code. In fact, a singleton was a C++ (and Java) hack invented to implement some kind of global variables, hidden behind a static class definition. They were historically introduced to support mixed mode of application-wide initialization (mainly allocate the stdio objects needed to manage the console), and were abused in business logic. Once you use a singleton, or a global variable, you would miss most of the benefit of OOP. A typical use of singleton is to register some class instances globally for the application. You may see some framework - or some part of the RTL - which would allow such global registration. But it would eventually void most benefits of proper dependency injection - see Dependency Inversion Principle - since you would not be able to have diverse resolution of the same class. Such global variables are a smell of a broken Open/Closed Principle, since your project would definitively won't be open for extension. Using a static class variable (as allowed in newer version of Delphi), is just another way of defining a global variable, just adding the named scope of the class type. Even if you do not define some global variable in your code, you may couple your code from an existing global variable. For instance, defining some variables with your TMainForm = class(TForm) class defined in the IDE, then using its global MainForm: TMainForm variable, or the Application.MainForm property, in your code. You will start to feel not right, when the unit where your TMainForm is defined would start to appear in your business code uses clause... just another global variable in disguise! In our framework, we tried to never use global registration, but for the cases where it has been found safe to be implemented, e.g. when RTTI is cached, or JSON serialization is customized for a given type. All those informations would be orthogonal to the proper classes using them, so you may find some global variables in the framework units, only when it is worth it. For instance, we split TSQLRecord's information into a TSQLRecordProperties for the shared intangible RTTI values, and TSQLModelRecordProperties instances, one per TSQLModel, for all the TSQLModel/TSQLRest specific settings - see Several Models. The "Liskov substitution principle" states that, if TChild is a subtype of TParent, then objects of type TParent may be replaced with objects of type TChild (i.e., objects of type TChild may be substitutes for objects of type TParent) without altering any of the desirable properties of that program (correctness, task performed, etc.). The example given by Barbara Liskov was about stacks and queues: if both have Push and Pop methods, they should not inherit from a single parent type, since the storage behavior of a stack is quite the contrary of a queue. In your program, if you start to replace a stack by a queue, you will meet strange behaviors, for sure. According to proper top-bottom design flow, both types should be uncoupled. You may implement a stack class using an in-memory list for storage, or another stack class using a remote SQL engine, but both would have to behave like a stack, i.e. according to the last-in first-out (LIFO) principle. On the other hand, any class implementing a queue type should follow the the first-in first-out (FIFO) order, whatever kind of storage is used. Using interface variable instead of class implementations. Here, we do not use inheritance for sharing implementation code, but for defining an expected behavior. Sometimes, you may break the Liskov Substitution principle in some implementation methods which would be coded just to gather some reusable pieces of code, preparing some behavior which may be used only by some of the subtypes. Such "internal" virtual methods of a subtype may change the behavior of its inherited method, for the sake of efficiency and maintainability. But with this kind of implementation inheritance, which is closer to plumbing than designing, methods should be declared as protected, and not published as part of the type definition. By the way, this is exactly what interface type definitions have to offer. You can inherit from another interface, and this kind of polymorphism should strictly follow the Liskov Substitution principle. Whereas the class types, implementing the interfaces, may use some protected methods which may break the principle, for the sake of code efficiency. Separate your classes hierarchy: typically, you may consider using separated object types for implementing persistence and object creation (this is the common separation between Factory and Repository patterns). You may even found in the dddInfraSettings.pas unit a powerful TRestSettings.NewRestInstance() method which is able to instantiate the needed TSQLRest inherited class from a set of JSON settings, i.e. either a TSQLHttpClient, or a local TSQLRestServerFullMemory, or a TSQLRestServerDB - the later either with a local SQlite3 database, an external SQL engine, or an external NoSQL/MongoDB database. You should note that, in the Liskov substitution principle definition, "parent" and "child" are no absolute. Which actual class is considered as "parent" may depend on the context use. Most of the time, the parent may be the highest class in the hierarchy. For instance, in the context of a GUI application, you may use the most abstract class to access the application data, may it be stored locally, or remotely accessed over HTTP. But when you initialize the class instance of a local stored server, you may need to setup the actual data storage, e.g. the file name or the remote SQL/NoSQL settings. In this context, you would need to access the "child" properties, regardless of the "parent" abstract use which would take care later on in the GUI part of the application. Furthermore, in the context of data replication, server side or client side would have diverse behavior. In fact, they may be used as master or slave database, so in this case, you may explicitly define server or client class in your code. This is what our ORM does for its master/slave replication - see Master/slave replication. If we come back to our bar-code scanner sample, most of your GUI code may rely on TAbstractBarcodeScanner components. But in the context of the application options, you may define the internal properties of each "child" class - e.g. the serial or USB port name, so in this case, your new "parent" class may be either TSerialBarCodeScanner or TUsbCodeScanner, or even better the TSerialBarcodeConnection or TUsbBarcodeConnection properties, to fulfill Single Responsibility principle. Some patterns shall never appear in your code. Otherwise, code refactoring should be done as soon as possible, to let your project be maintainable in the future. This later piece of code does not check self, but the fProtocol protected field. So even if you try to implement the Single Responsibility principle, you may still be able to break Liskov Substitution! Note that both patterns will eventually break the Single Responsibility principle: each behavior shall be defined in its own child class methods. As the Open/Close principle would also be broken, since the class won't be open for extension, without touching the parent class, and modify the nested if self is T* then ... or case fProtocol. * of ... expressions. Another code smell may appear when you define a method which will stay abstract for some children, instantiated in the project. It would imply that some of the parent class behavior is not implemented at this particular hierarchy level. So you would not be able to use all the parent's methods, as would be expected by the Liskov Substitution principle. Note that the compiler will complain for it, hinting that you are creating a class with abstract methods. Never ignore such hints - which may benefit for being handled as errors at compilation time, IMHO. The (in)famous "Abstract Error" error dialog, which may appear at runtime, would reflect of this bad code implementation. We expected this class to fully implement the TAbstractBarcodeProtocol contract, whereas calling TEMailEmulatedBarcodeProtocol.ReadFrame would not be able to read any data frame, but would raise an exception. So we can not use this TEMailEmulatedBarcodeProtocol class as replacement to any other TAbstractBarcodeProtocol class, otherwise it would fail at runtime. A correct implementation may perhaps to define a TFakeBarcodeProtocol class, implementing all the parent methods via a set of events or some text-based scenario, so that it would behave just like a correct TAbstractBarcodeProtocol class, in the full extend of its expectations. Last but not least, if you need to explicitly add child classes units to the parent class unit uses clause, it looks like if you just broke the Liskov Substitution principle. SerialBarcodeScanner; // Liskov says: "it smells"! UsbBarcodeScanner;    // Liskov says: "it smells"! If your code is like this, you would have to remove the reference to the inherited classes, for sure. Your abstract parent class should not be coupled to a particular Operating System, or a mean of communication, which may not be needed. Why would you add a dependency to raw RS-232 communication protocol, which is very likely to be deprecated. One way of getting rid of this dependency is to define some abstract types (e.g. enumerations or simple structures like record), which would then be translated into the final types as expected by the ComPort.pas or Windows.pas units. Consider putting all the child classes dependencies at constructor level, and/or use class composition via the Single Responsibility principle so that the parent class definition would not be polluted by implementation details of its children. You my also use a registration list, maintained by the parent unit, which may be able to register the classes implementing a particular behavior at runtime. Thanks to Liskov, you would be able to substitute any parent class by any of its inherited implementation, so defining the types at runtime only should not be an issue. The SOA and ORM concepts, as implemented by our framework, try to be compliant with the Liskov substitution principle. It is true at class level for the ORM, but a more direct Design by Contract implementation pattern is also available, since the whole SOA stack involves a wider usage of interfaces in your projects. Interface segregation should first appear at class level. Following the Single Responsibility principle, you are very likely to define several smaller classes, with a small extent of methods. Then use dedicated types of class, relying on composition to expose its own higher level set of methods. This single OnBarcodeScanned event will be the published property of the component. Both protocol and connection details would be hidden within the internal classes. The final application would use this event, and react as expected, without actually knowing anything about the implementation details. The SOA part of the framework allows direct use of interface types to implement services. This great Client-Server SOA implementation pattern - see Server side Services - helps decoupling all services to individual small methods. In this case also, the stateless used design will also reduce the use of 'fat' session-related processes: an object life time can be safely driven by the interface scope. By defining Delphi interface instead of plain class, it helps creating small and business-specific contracts, which can be executed on both client and server side, with the same exact code. Since the framework makes interface consumption and publication very easy, you won't be afraid of exposing your implementation classes as small pertinent interface. For instance, if you want to publish a third-party API, you may consider publishing dedicated interfaces, each depending on every API consumer expectations. So your main implementation logic won't be polluted by how the API is consumed, and, as correlative, the published API may be closer to each particular client needs, without been polluted by the other client needs. DDD would definitively benefit for Interface Segregation, since this principle is the golden path to avoid domain leaking - see DTO and Events to avoid domain leaking. This principle results in Inversion Of Control (aka IoC): since you rely on the abstractions, and try not to depend upon concretions (i.e. on implementation details), you should first concern by defining your interfaces. In conventional application architecture, lower-level components are designed to be consumed by higher-level components which enable increasingly complex systems to be built. This design limits the reuse opportunities of the higher-level components, and certainly breaks the Liskov substitution principle. For our bar-code reader sample, we may be tempted to start from the final TSerialBarcodeScanner we need in our application. We were asked by our project leader to allow bar-code scanning in our flagship application, and the extent of the development has been reduced to support a single model of device, in RS-232 mode - this may be the device already owned by our end customer. This particular customer may have found some RS-232 bar-code relics from the 90s in its closets, but, as an experience programmer, you know that the next step would be to support USB, in a very close future. All this bar-code reading stuff will be marketized by your company, so it is very likely than another customer would very soon ask for using its own brand new bar-code scanners... which would support only USB. So you would modelize your classes as above. Even if the TUsbBarCodeScanner - and its correlative TUsbBarcodeConnection class - is not written, nor tested (you do not even have an actual USB bar-code scanner to do proper testing yet! ), you are prepared for it. When you would eventually add USB support, the UI part of the application won't have to be touched. Just implementing your new inherited class, leveraging all previous coding. Following Dependency Inversion from the beginning would definitively save your time. Even in an Agile kind of process - where "Responding to change" is most valuable - the small amount of work on implementing first from the abstraction with the initial implementation would be very beneficial. In fact, this Dependency Inversion principle is a prerequisite for proper Test-Driven Design. Following this TDD pattern, you first write your test, then fail your test, then write the implementation. In order to write the test, you need the abstracted interface of the feature to be available. So you would start from the abstraction, then write the concretion. Our Client-Server architecture facilitates this decoupling pattern for its ORM part, and allows the use of native Delphi interface to call services from an abstract factory, for its SOA part. A set of dedicated classes, defined in mORMot.pas, allows to leverage IoC: see e.g. TInjectableObject, TInterfaceResolver, TInterfaceResolverForSingleInterface and TInterfaceResolverInjected, which may be used in conjunction with TInterfaceStub or TServiceContainer high-level mocking and SOA features of the framework - see Interfaces in practice: dependency injection, stubs and mocks and Client-Server services via interfaces. Feel free to comment this article in our forum, as usual!